Recalling being blown into the weeds by a sharp-sounding and decidedly rapid JH Special Triumph Tiger Cub, John McCrink visits the man who created it and marvels at his home-brewed craftsmanship. About 10 years ago, while taking part in one of Pete Remington’s excellent Nostalgia Road Runs in the Lake District, I was riding out of Ambleside on my Triumph 500 and quickly found myself on an extremely steep, uphill climb (1-in-4 no less) known locally and most aptly as ‘The Struggle’. 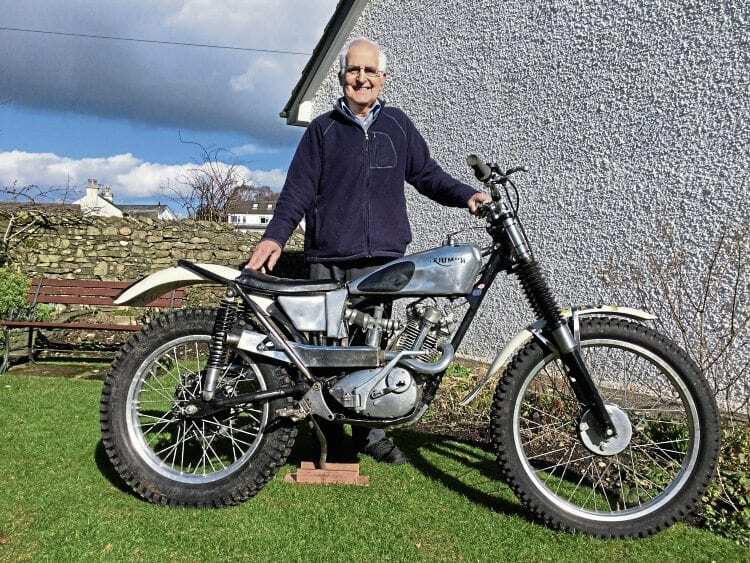 John Holmes looks rightly pleased with one of his beautifully built Triumph Tiger Cub trials bikes. As the revs plummeted and I was about to drop down a gear, I was suddenly overtaken by a decidedly rapid and fantastic-sounding Tiger Cub trials bike that was making easy meat of the gradient. I got only got a quick glimpse of bike and rider before they disappeared in the direction of the Kirkstone Pass, but it was enough to tell me that I’d been blown into the weeds by none other than John Holmes from Natland, near Kendal, on one of his famous JH Specials. I first saw John competing on one of his Cubs back in 1991 when we were both riding in the Saturday night trial at the famous Nostalgia Scrambles track near Sedbergh, Cumbria. His bike certainly lived up to the title ‘Special’ as it simply bristled with innovation and inventiveness. That was the first of John’s specials that I had ever clapped eyes on, but a few more have been built since then, all of them demonstrating the Holmes hallmarks of originality, ingenuity, uniqueness and pure craftsmanship. John’s bikes have become extremely well-known and widely admired in the classic trials scene, not only because they look superb, but also because they perform so brilliantly, but we’ll come to that later. Previous Post:We admired the Honda CB750, shook our heads and said this was the end – how right we were!